So you see this picture and you think, “Alright, most of the movie’ll be like this.” But it won’t. 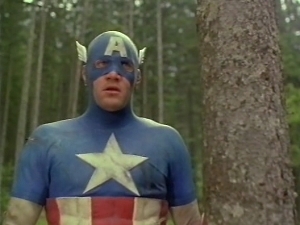 So, after reviewing four other films, we finally get to this Captain America. Thanks to its director’s reputation among internet-savvy Bad Movie aficionados, this movie arguably “enjoys” the highest profile of any pre-2011 Captain America production. That’s unfortunate because it’s a terribly flawed film that nevertheless remains faithful to its source material in ways no superhero movie would even try match until the turn of the millennium.